KANEOHE, OAHU (HawaiiNewsNow) – Armed with maps and Google Earth images, inspectors from the State Department of Health’s Clean Water Branch sought permission Monday to cross private property in Kahaluu to test the water in Kahaluu Stream. “We can’t tell what’s going on in the stream itself between certain areas and Kahekili Highway,” environmental health specialist Scott Murakawa said. 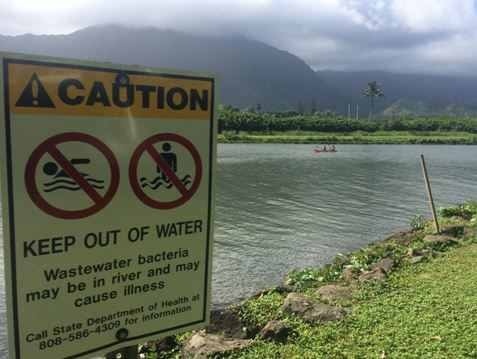 The Health Department needs to test the stream water as it tries to pinpoint the source of bacteria contaminating the lagoon and the channel that leads to Kaneohe Bay. “We’ve been able to access points that are quite far apart. What we want is to narrow that down” inspector Wataru Kumugai said. The inspectors delivered letters to three properties, asking for permission to collect water samples starting Wednesday. The state wants to increase the number of test sites. “It’s important so we can determine what’s going on in the watershed,” Murakawa said. The state also wants to inspect a stream that runs alongside the city’s Ahuimanu Wastewater Pre-Treatment Facility. That stream connects another watershed to the lagoon. “As we go along with the sampling plan, we’ll reassess and possibly look at other properties in the future,” Murakawa said. Those properties could be some of the 600 homes near the lagoon that have cesspools. Some of them may be malfunctioning. Kurt Tateishi has lived in his Kahaluu home on Ahaolelo Road for over 50 years. He said his cesspool has not overflowed, but he is worried that the state may begin cracking down on cesspool owners. Murakawa said he and Kumugai will return Wednesday to collect water samples from the stream. It’s the next step in the process of elimination to find the source of bacteria that caused the state to post caution signs that wastewater bacteria may be in the lagoon. This entry was posted in 808-260-3558 and tagged Bing, Cesspool Locates, Facebook, Google, Hawaii, Hawaii Private Locators, Linkedin, Pinterest, Pipe Locating, SinkHole, Twitter, Underground Inspections, Utility Toning by Dave. Bookmark the permalink. Powered by Aloha Mana | HPL-LLC 2015 Privacy and Terms.